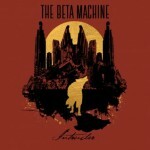 Share the post "Album review: THE BETA MACHINE – Intruder"
The Beta Machine hail from Los Angeles, led by A Perfect Circle’s rhythm section of bassist, vocalist and keyboardist Matt McJunkins and drummer Jeff Friedl. They are joined by vocalist Claire Acey and guitarist and keyboardist Nicholas Perez. In 2017 they released an EP ‘All This Time’ and now they are set to unleash their debut album. The Beta Machine have their own sound, one that relies heavily on synths/programming, the tight bass lines of Matt McJunkins and the way the aforementioned McJunkins and Claire Acey’s vocals combine together so well. There are hints of Depeche Mode on the instant melody of the single ‘Embers’ and on ‘Someday’, whilst ‘Precious Design’ recalls QOTSA in the driving backbeat. ‘Bones’ is a winner with the synths/keys to the fore and another fine duet from McJunkins and Acey. It has an eerie feel both lyrically and in the musical arrangements. Elsewhere though ‘The Fall’ is a bit too much of a mish mash of styles, although it does feature one of the album’s heaviest guitar solos. The closing duo of ‘Intruder’ and ‘Bleed For You’ reminded me of the much missed Pure Reason Revolution. Both bands cleverly mix complex musical passages with simple, yet effective melodies. This entry was posted in ALBUM REVIEWS, ALBUM REVIEWS (Mobile), All Posts and tagged A Perfect Circle, album, alternative, Depeche Mode, Electronic Rock, Intruder, review, rock, synth pop, the Beta Machine. Bookmark the permalink.